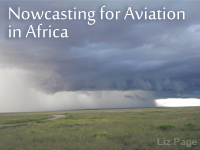 Nowcasting for Aviation in Africa summarizes techniques and best practices for developing area-specific forecasts at very short (0-6 hour) timescales. This 1-hour lesson presents a case study focused on interpreting threats and communicating correct warning information for a weather event affecting multiple airports in Gauteng Province, South Africa. In completing the lesson, the learner will assess the state of the atmosphere, develop a nowcast, monitor conditions, and update/create appropriate nowcast products for aviation stakeholders.